Axonal and Dendritic densitity may be increasing given inherent neuronal plasticity, along with supporting glial cells, rather than an increase in neuronal cell bodies. This may inhibit unchecked limbic discharges and the severity of the overall derangement of the circadian regulatory system. Interestingly this would effect neuroendocrine activity all the way back to the pineal gland and its periodic metabolic transfer of serotonin to melatonin and vice versa with the sleep-wake cycle in response to light and dark stimulation of the retina. Apparently this area is acutely sensitive to limbic activity, just as limbic activity is modulated by paralimbic dampening. A next step would be to look at the microarchitecture of local area synapatic connections in its three dimensional domain. Of side interest is how much of the synapse's 3-d geometry is a funtion of the surrounding glial cells, for a simple blossuming of these cells could drive the shape and functionality of the neuronal connections. Perhaps bipolar disease, is a problem of genetic coding of the supporting glial which alters the integrity of the neuron linkage and function. The toxic effects of high levels of crh and cortisol secondary to stress and upregulation may well be on the glial and not the neuron for which the neuron trys to compensate inadequately. I think current research is only looking at neuromodulators and neurotransmitters and a few other issues, membrane receptors, etc. But I don't think there is any research looking at the synapse in its full 3-d manifestation. Supporting and nutrient surrounding glial, local osmotic effects and local electrolytic concentrations would all be affected by the lithium cation in the mix. If you could stand inside the synaptic cleft and peek outside around it you would see how the local structure is key to optimal functionality for efficacious neurotransmission, clearance, and regeneration of the synaptic endplate. As always, great reading on your blog. 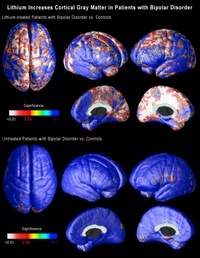 Research like this is going to go a long ways to understanding illnesses like Bipolar Disorder. I would love to see the same imaging on drug naive currently manic and depressed subjects.